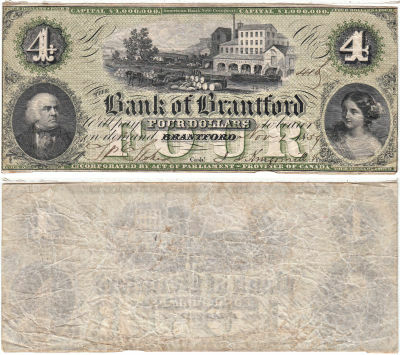 Bank of Brantford (Brantford). Gorgeous green tint with Vignette of loading flour at the flour mill. Dated November 1, 1859. A most attractive and desirable note. 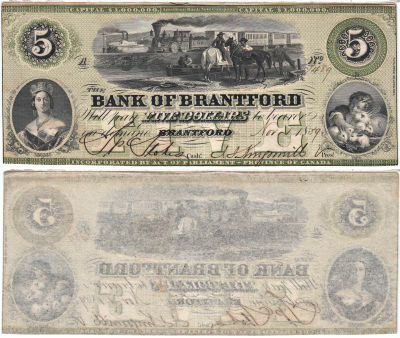 Bank of Brantford (Brantford). Gorgeous green tint with Vignette of Steam Train, Steam Ship and boat. Dated November 1, 1859. A most attractive note and scarce as well. 1904. Costa Rico. Five Colons. CCU. 1917. Costa Rico. One Colon. CCU.